Foundation president Michelle Chaudhry, daughter of war hero Catholic Cecil, denounces another case of "abuse" committed in the name of the blasphemy law. For her, "too much blood has been already spilled" and "too many innocent lives have been lost." As police, judiciary and government institutions ignore the attack, perpetrators remain at large. Lahore (AsiaNews) - The Cecil Chaudhry & Iris Foundation (CICF), an NGO active in the defence of minorities in Pakistan, strongly condemned the attack against the Ahmadi community in Gujranwala, Punjab province. The incident (pictured) took place at the end of July, triggered by allegations of blasphemy that led to a revenge attack. At least four people were killed, including two children (a seven-year old child and an eight-month-old toddler), plus several wounded. However, local authorities have not opened an investigation into the matter; so far, there have been no arrests or detention of suspects for the attack. 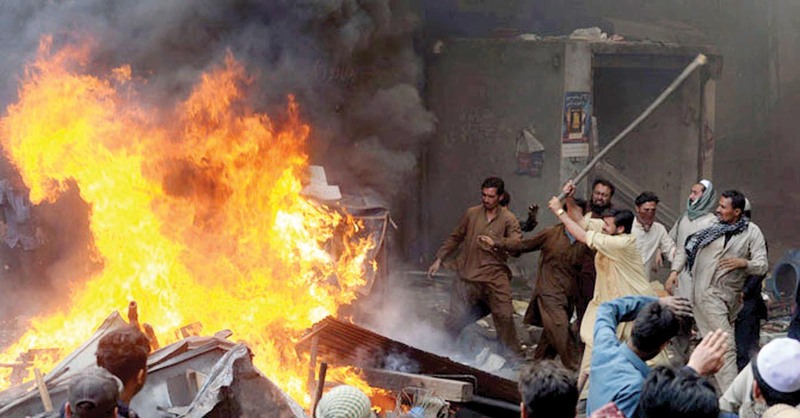 On 27 July, a mob attacked and set fire to some houses belonging to Ahmadis, members of a Muslim minority that has been persecuted because it does not recognise Muhammad as the last prophet. Politicians, government institutions and local authorities have been unwilling to condemn the assault, showing a "hypocritical attitude" that has resulted in the denial that violence even occurred in Gujranwala. Founded in the late 19th century in India, the Ahmadi doctrine is considered "heretical" by most of the Muslim world, both Sunnis and Shias. It honours its founder, Mirza Ghulam Ahmad, and has beliefs that related to other religions. In Pakistan, the law bans its followers from using Islamic greetings and prayers, or refer to their places of worship as "mosques". For this reason, like Christians Ahmadis are often victims of the blasphemy law, which is used to persecute minorities. Michelle Chaudhry, president of Cecil Chaudhry & Iris Foundation (Cicf), is one the few voices that slammed the attack expressing solidarity with the victims and their family. The activist calls for government protection for all citizens, without distinction of religion, "as required by the Constitution." She slammed the latest case of "abuse" of the blasphemy law, which is often used against non-Muslims to settle personal scores, and expressed hope for "concrete measures" to stop violence carried out in the name of the law. "Too much blood has already been spilled," she explained, "and too many innocent lives have been lost." The Cecil Chaudhry & Iris Foundation is inspired by the memory of Cecil Chaudhry, a Pakistani Air Force hero, a Catholic and a human rights activist involved in the education of poor children and the disabled. Friend and collaborator of Shahbaz Bhatti, Pakistan's minister for minorities assassinated on 2 March, 2011, the retired pilot died 13 April 2012 in Lahore, after a long battle against cancer. Chaudhry was an active supporter of the National Commission for Justice and Peace, and for 14 years led the campaign that saw the restoration of universal suffrage in 2002.